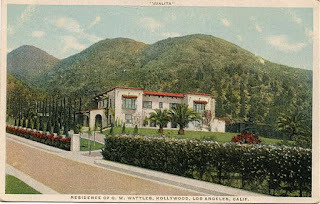 Wattles Mansion, a historic house in Hollywood owned by the city of LA was selected as the location for a designer show house (each room done by a different designer) that was on view this spring. Angeleno magazine sponsored the event, and will publish the interiors in an upcoming issue. 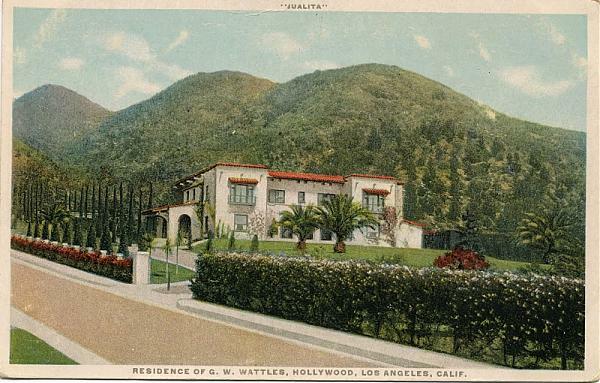 Wattles Mansion was designed by Myron Hunt and Elmer Grey, the architectural team responsible for the Huntington Mansion and Library in Pasadena. It was completed in 1907. The theme chosen for the show house house was "100 Years of Hollywood". As part of this event, Annica Howard and I designed a guest suite, and we chose Alfred Hitchcock's "The Birds" as our inspiration. We found many ways in which this movie allowed us to pursue an interior in a style that we gravitate to in our work. The birds themselves would become a sweet element in the room in contrast with their frightening role in the film. Above and below: Various views of Tippi Hedren in The Birds. The green tone of Hedren's suit was the inspiration for the paperbacked silk wall-covering we selected. 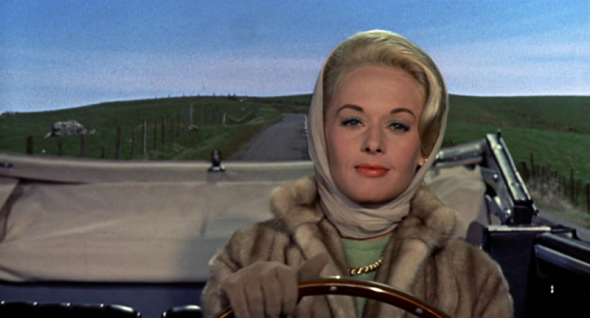 Hitchcock chose the color green as he felt it evoked a "cool chaste quality". Edith Head was the costume designer, and she designed with classic lines so that the wardrobe would stand the test of time. 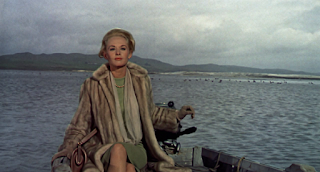 The concept for our room was contrasting the rustic nature of the setting, a northern California beach town, Bodega Bay, with Tippi Hedren's glamorous style. 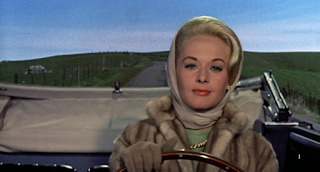 Hedren arrives from San Francisco to Bodega Bay in a mink coat, pearls, and a silk scarf covering her coiffed hair, perfectly in place, despite the journey in a motor boat and a convertible! 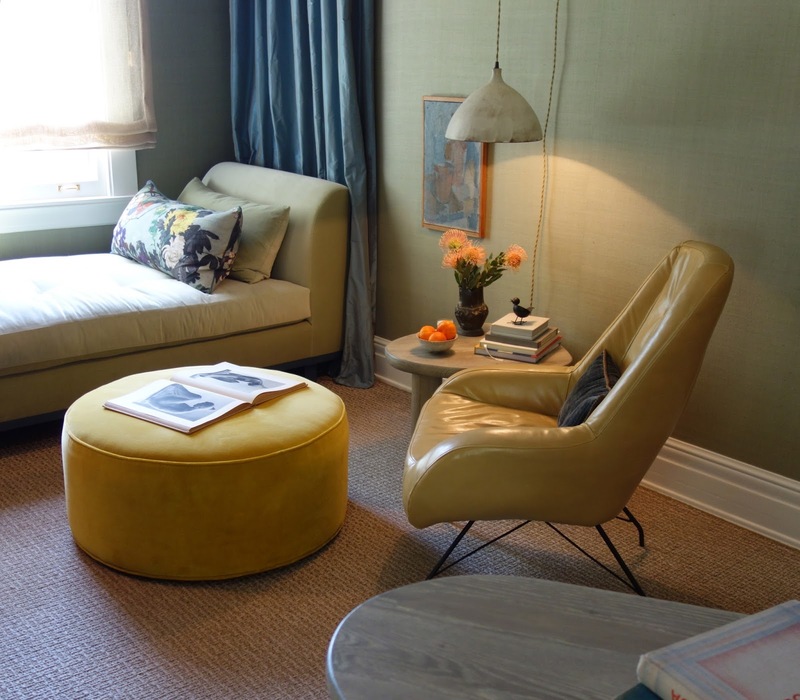 Above: The guest suite we designed was formerly a staff bedroom. 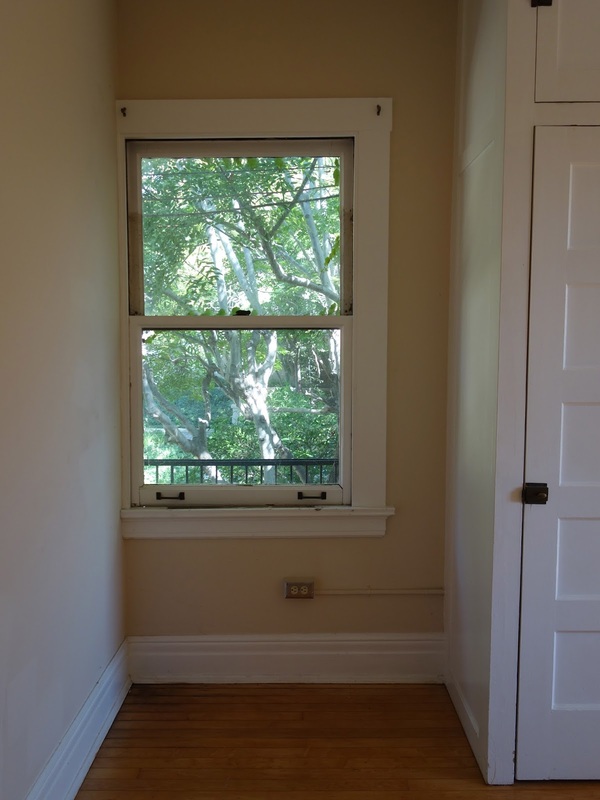 It's a small room, only 8-1/2 feet wide, yet we thought it could be a rewarding space to work with. The room offered the perfect spot for a daybed window seat at the far end. The watery blue silk taffeta drapery treatment surrounding the daybed brings in a glamorous feel, and creates a focused sense of place. The soft colors are energized by the bright yellow of the velvet ottoman. The tiny landscape, left of the window, is Bend in the River, 2008, by Poogy Bjerklie. It's intimately close to the viewer lying on the daybed. Above: At the near end of the room, we included an angled writing table I designed. The angled front allowed for easy movement into the room. The curved corners made it easy to slip into the narrow space between the closet and the table. The brass table lamp echoes the curves of the table. 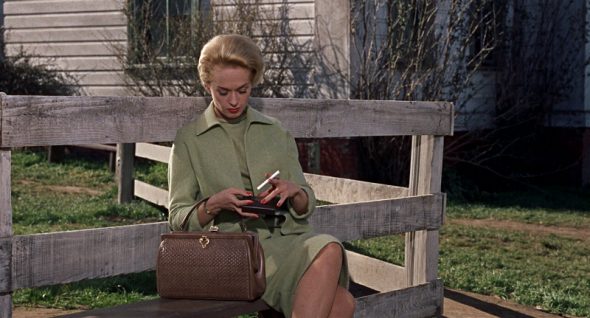 The satin brass legs are a reference to Hedren's platinum hair and silk scarf. The mixed media painting is by Eugene Brodsky. Above and below: This is the way the room looked before we started. Above and below: The rustic character of Bodega Bay is seen in the driftwood finish of the writing table, the rough ceramics, and the textured wool and jute carpet. The brass evokes Hedren's sophisticated style and her coloring. The netting of the blinds is reminiscent of her silk scarf, as well as fishnet, a combination of the themes in one material. 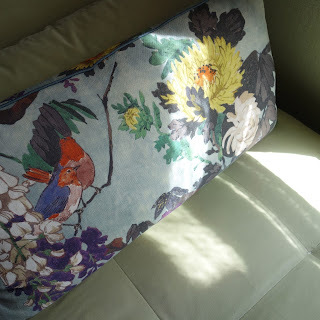 Above and below: Birds make an appearance inside the closet, in the pattern of an old fashioned English wallpaper. Above and below: The view into the room, with the closet door open, showing the inset wallpaper panels on the back of the door. You can see a bird perched on top of a panel we built out from the wall. We installed the panel to cover an exposed wiring channel, set off the photograph, and level the wall to the depth of an outlet box, so that the bookshelf would sit flush to the wall. Above: Birds congregate on a bookshelf, as though they've wandered out of the photo. The rough ceramic pots and the pendant light are by Uplifters Ceramics. They have the rustic character of the film's setting. 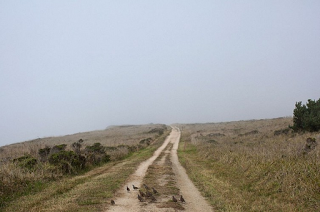 Below: This C-print photo, 2014, by Jason Frank Rothenberg, is taken in Point Reyes, not far from Bodega Bay. The tiny quail are in keeping with the peaceful nature of the birds in the room. The photo brought a sense of depth to the small room...like a view into a far horizon. It's also personal, a favorite place to walk. Above: More birds can be discovered on the pillows. Above: Blue Bottles, 1951, by Swedish artist, Philip Von Schants, anchors the sitting area. It's hung low on the wall, meant to be appreciated from a seated point of view. Also, hanging art low creates a dynamic interaction with the furniture...a set piece. Above and below: The ceramic pendant lamps are from Uplifters Ceramics, and fitted with a bronze cap, and a silk twisted cord. 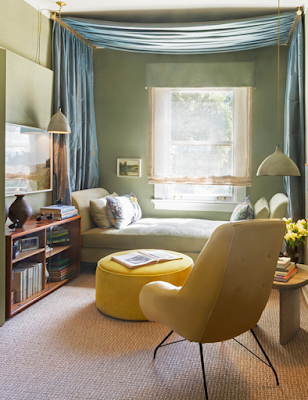 Hanging the pendant low over the side table makes a focused pool of light. The lounge chair is Brazilian, designed by Martin Eisler in the 1960s. The small room is made easier to move through by the use of rounded furnishings...the desk, the lounge chair, the ottoman, and the side table. Above and below: The view towards the hall, where we installed a metal wall decoration that fits perfectly on the angled wall over the stair. To the right is the guest suite bath we designed. Above and below: We selected the shimmery metallic wallpaper, like an antique mirror, and the brass fittings, as the glamorous elements. We used a cork table, a vintage rusted planter, seagrass planting in the window box, the sand toned drapery, and the seascape, to bring to mind the seaside town. 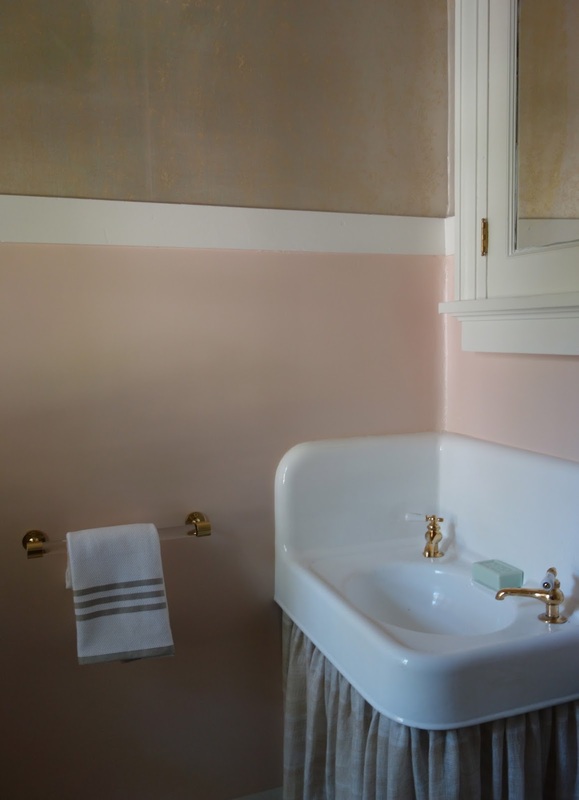 Above: We had a skirt made from the drapery fabric to dress up the existing corner sink. 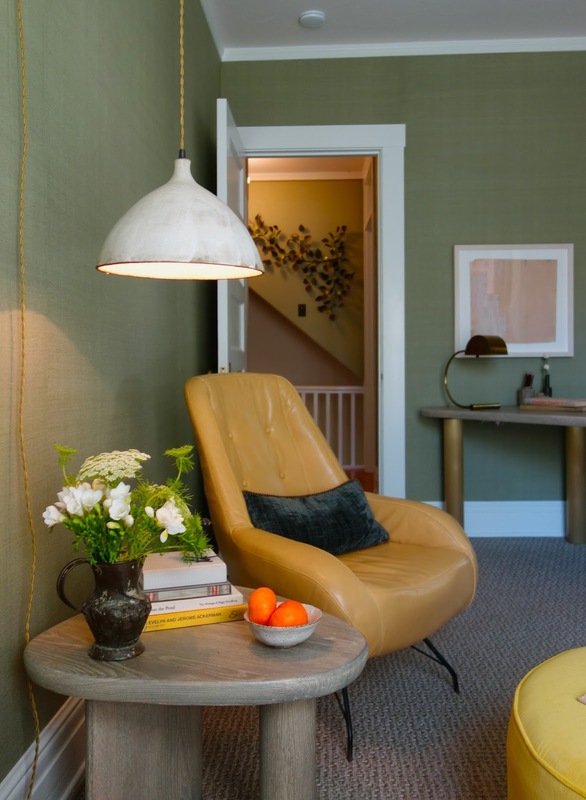 Below: The brass and powder coated sconce is reminiscent of a shell form.